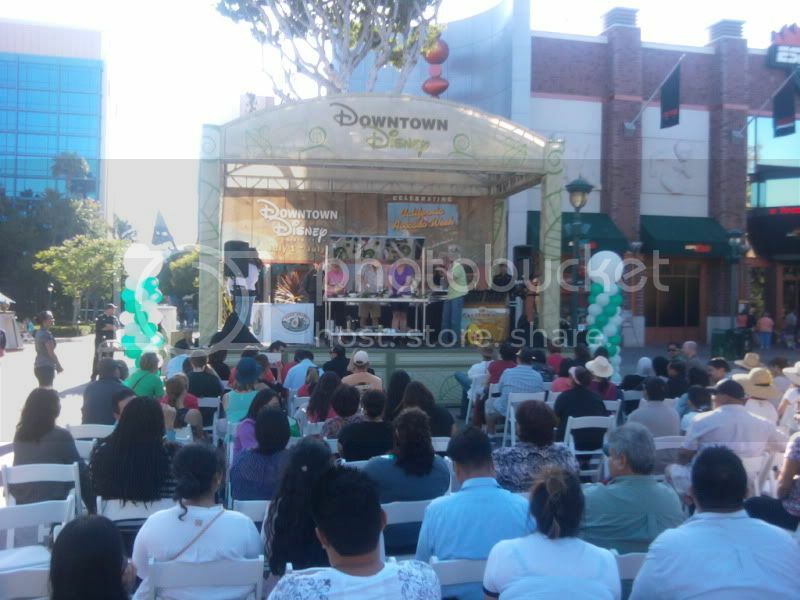 It’s California Avocado Week at Downtown Disney in Anaheim, and Cooking with Mickey got a front row seat to media day on July 2. The history of the avocado stretches all the way back to 10,000 B.C., and now there are over 500 varieties of avocados enjoyed around the world. However, there is one in particular that is consumed most in the world, and it all started right here in Southern California. The Hass Avocado originated just miles from Disneyland in La Habra, California, by amateur horticulturist Rudolph Hass back in 1926. The seedlings from that one avocado tree have spread all over California and now account for 80% of all avocados grown worldwide. The California Avocado Commission hosted it's second annual Avocado week to commemorate this extraordinary fruit. Each night during the week of July 1-7, a chef from one of the fantastic Downtown Disney restaurants puts on an interactive cooking demonstration for a live audience on the main stage. The emcee for the event is Disneyland Resort’s resident dance party DJ, Wendy Walker. She introduced all the head chefs from each participating restaurant and entertained the audience with her lively personality and music. We had the pleasure of watching ESPN Zone's Executive Chef Tom Keaveny make one of his creations for avocado week, Mini California Avocado Shrimp Club. ESPN Executive Chef Thomas Keaveny talking about his dish he is going to prepare. Here is the recipe for Mini California Avocado Shrimp Clubs. De-seed Serrano pepper and finely dice. Peel and de-seed avocado and place in a blender or food processor with Serrano pepper, heavy cream, and lemon juice and blend until smooth and well incorporated. Slice the baguette in 1/4" slices and brush with olive oil, season with salt and pepper, then grill until lightly toasted. Spread baguette slices with a light layer of avocado mousse, top with Roma tomato slice, poached shrimp, a dollop of avocado mousse, and bacon. I really enjoyed this treat. The avocado mousse was so creamy and flavorful. I especially loved it with the shrimp and bacon. Yummy! This simple, yet delicious recipe is perfect for any party or get together. The whole audience was oohing and ahhing while enjoying this little treat. After the demonstration, three guests were chosen from the audience to participate in a guacamole contest, or Guac-Off. Each contestant was given 15 minutes, all the avocados they could ask for, and 19 additional ingredients ranging from garlic and tomatoes to mango and pineapple, in order to create their own guacamole. Surprisingly, two of the three contestants had never made guacamole. After the time expired, each of the Guac-Off contestant creations were then given to the judges—ESPN Zone Chef and demonstrator Tom Keaveny, one of the managers of ESPN Zone, and a very special guest, Doug O'Hara, avocado grower and Vice Chairman of the California Avocado Commission. In the end, the winner was Kristen—one of the new guacamole makers—from Anaheim. As the winner of the Guac-Off, she received a $100 ESPN Zone gift card and an $85 California Avocado gift pack. The other two contestants also received participation gift bags. After the public events ended, we walked through Downtown Disney and made our way to Catal Restaurant for a special VIP dinner, where Catal Executive Chef Nicholas Weber had designed a delicious avocado-inspired menu. As we entered the private second floor dining area, we were greeted by several members of the Catal staff, Jan DeLyser of the California Avocado Commission, as well as Chef Steven Mary who introduced and explained the three courses on the beautiful menu. 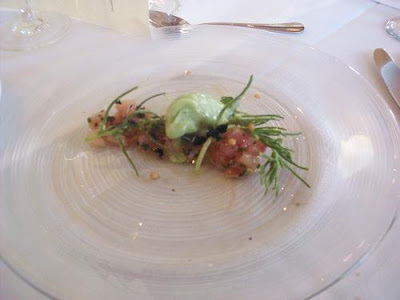 Our first course was the tartare of Japanese humachi with green shiso, crispy wakame, agretti and California avocado-jalapeno sorbet. While I am not typically a huge fan of raw seafood, after having this beautifully-made appetizer, I think I will being to rethink this. Originally I thought that the jalapeno in the sorbet was going be overpowering, but it wasn't. In fact, the creamy flavor of the avocado and the cold, sweetness of the sorbet took over. Also, the humachi didn't have that fishy taste that I was expecting, and the freshness made it so easy to enjoy. After this, I might just have to give Yellowtail a better try. My wife was not quite ready to try the humachi, so she opted for the vegan option instead, which she really enjoyed. Our second course, a confit of suckling pig with sweet corn, zucchini blossoms, smoked pork jus, smoked California avocado and house made chicharrones, was something I wish I could eat everyday. The pig was cooked perfectly. A nice, crispy skin on top of the most amazingly tender pork, that just shredded as you pulled it apart and melted in your mouth. 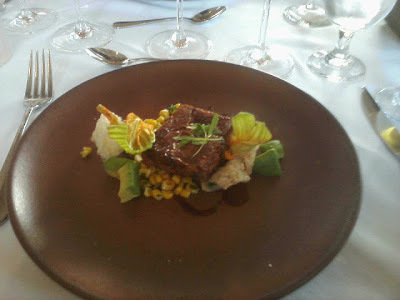 The addition of the smokey jus and the sweet corn, made the meat even that much more favorful. This dish was almost perfectly balanced. The chicharrones were fried to the perfect crispiness, however, I wanted more of the smoked avocado along with it instead if the three small chopped pieces that came with it. Even still, definite kuddos should be given to Chef Weber for this entree. Our third and final course, was a double chocolate tart with California avocado mint puree, lace tuille and Harry's berries blackberries. This dessert was absolutely amazing and the perfect ending to our experience! 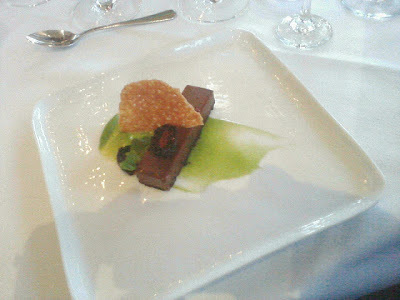 The chocolate mouse in the tart was so rich and decadent, yet smooth and creamy. The added textures of cookie crust, lace tuille and blackberries made this dessert over-the-top. 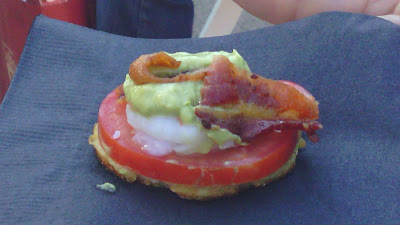 However, I wasn't too impressed with the avocado mint puree. The mint flavor was very strong and over-powered the avocado, and I didn't really think it added anything but color to the dessert. During California Avocado Week, the following Downtown Disney locations will feature special menu items that highlight California Avocados. Tortilla Joe's - Ceviche de Hachinango Shots, Shrimp and California Avocado Enchiladas, and a Avocado Margarita. Special thanks to Jan DeLyser of the California Avocado Commision, Elizabeth Santos of GolinHarris, Doug O'Hara, and all those at Catal Restaurant for their hospitality and for hosting such a fun event. It was also such a pleasure speaking with and learning from other food bloggers from California. I want to thank them for their wonderful advice and company during our dinner. Laura Bashar of FamilySpice.com, Carolyn Scott of HealthyVoyager.com, and Mimi of MimiAvocado.com. Also, I want to thank Kristen for allowing my wife Taylor and I to attend this event and represent Cooking With Mickey. I know Kristen really wanted to go to this event, but I am so thankful that gave me this opportunity, and for giving me an experience I will never soon forget--my first media event as a food blogger. Follow me Twitter @big_bubba_b for Disneyland news, updates, trip reports, and food news. You can also catch me on Sorcerer Radio's (SRSounds.com) Disneyland Magic with your host William "Yetichaser" Hershey, airing Wednesdays at 5am pst/ 8am est for even more Disneyland news . I'm glad you enjoyed it. I do wish I could have been there. The food looks amazing! After all of your tweets that night I had to go out and buy avocados.